For anyone who might need it, here is the (rare?) schematic of the Maxon SMP-4004C programming adapter, used with the Maxon SM-4150 and SM-4450 mobile radios. This adapter may also be compatible with the GE Monogram series of radios, using the software for the Monogram. Some versions of this adapter had a "red wire" that was hooked to a pin on the main board of the radio to supply power to the adapter. This version appears to have a jack on it to hook a 'wall-wart' power supply to it. All device numbers in the schematic are surface mount devices, as the factory unit was mounted inside a 25 pin D-sub shell. It shouldn't be a problem to find devices with the same specs in a standard 'thru-hole' package, if needed. In order to solve some apparent confusion, the DB25F connector at "P1" in the schematic is for a serial (COM) port, not a parrallel port. A nine-pin plug could be used just as easily as a 25-pin. I will add the correct pin numbers for use with a nine-pin plug if needed. 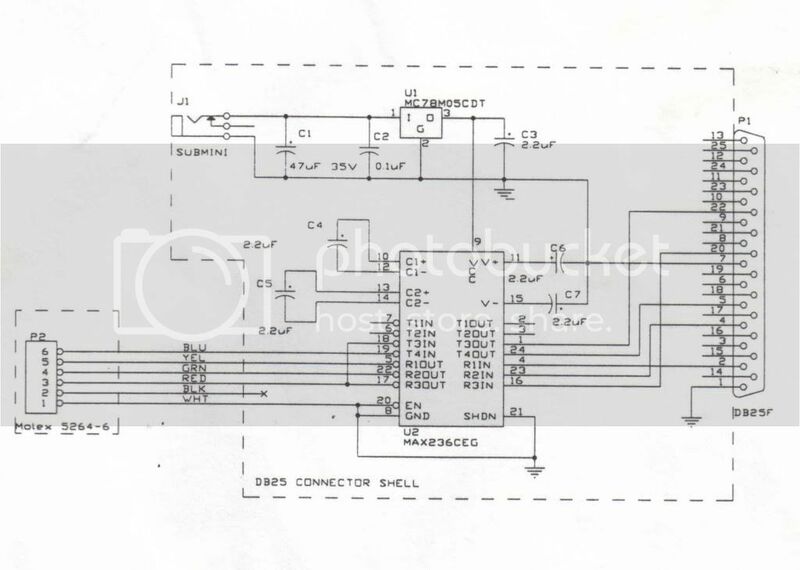 BTW, this is a 'genuine' Maxon schematic, not an untried knock-off. This is what is actually inside the original Maxon adapter. Last edited by KF4SQB on Sun May 31, 2009 2:54 pm, edited 2 times in total. Ask. Can't I write the created file directly to the eeprom 93c56 with my eeprom willem programmer ? While I'm sure that could be done, you would have to know exactly what portion of the EEPROM contains the info that you need to overwrite. You've just possibly overwritten parts of the EEPROM that shouldn't have been overwritten. I'm not that familiar with Maxon, but it may be time to find a repacement EEPROM from Maxon. Have you got any info on the Maxon SMP4002 Programming lead or the circuit on how to make the 25 way D socket adapter / lead. I tried your email as listed on qrz.com but you appear to have changed email address. Require help to obtain or make the Maxon SMP2002 Programming lead. I have a number of Lowband PM150's that have selcall boards futted. I need to switch off the selcall & C.T.C.S.S. KF4SQB wrote: For anyone who might need it, here is the (rare?) schematic of the Maxon SMP-4004C programming adapter, used with the Maxon SM-4150 and SM-4450 mobile radios. This adapter may also be compatible with the GE Monogram series of radios, using the software for the Monogram. I sent an email to the wetsnet address in the post with a request for a copy of the schematic...I figured I'd post here just in case you don't receive email at that address anymore. If that's a bad address for you, if you let me know here I will PM you...Thanks!! I don't know if the schematic shows up for everyone else like it does for me or not (part of it cut off), but if it does, just right click on it, and select "View Image" to see the whole thing. Also the SPC-4000 Programming cable for Maxon 2150/4450 also works on the GE Monogram mobiles. To program these radios you remove the top cover, unplug the option / audio board @ J-12. Plug in the programming cable and connect the red wire to pin 1 on J-12. Connect power to the radio and hold down the "P"button while turning on. The radio should display PrOg. on the display. Read and write your channels and when done make sure you replace the little option / audio board. Note I have the Programmer that you describe as being the one in the Schematic HOWEVER IT IS NOT! I traced every wire Pin to Pin I do have a Correct Schematic for this Programmer I will Post it. One Glaring error is Pin 20 does not tie to Pin 8. I will post the correct schematic as soon as possible. It would be good if Laurin WB4IVG had a SPC4000 programmer scheme. I would be very grateful. I have built a KF4SQB programmer but it is not working. One of the wiring errors is capacitor C6, it should be connected to pin 9 + 5V - according to the catalog. I am necessarily looking for a functional scheme. I spent many hours on this circuit, but I couldn't revive it. Please Laurin, if you have a programmer, I would be very grateful for a flawless scheme. Thank you very much and I wish you a lot of success with MAXON. Sorry my English - google translator.